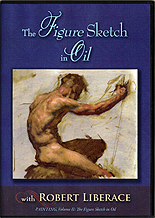 In this DVD, Rob uses a full color palette to explore the figure in oil. So get a front row seat and follow along as he begins with a simple monochrome sketch of the figure which is then blocked in, shaped, and detailed in a single sitting. Important features of the painting process are explored - from a dynamic underpainting to controlled anatomical modeling. Special features include a section on materials plus video previews from the other available DVD. Total running time is 3 hours and 33 minutes.